Finally, you have prepared your luggage and got everything on your packing list. Next stop: Italy! Either for the food, museums or maybe for nature; Italy is a magnificent place and one of the must-visit countries in Europe. In order to help you to provide a more budget friendly trip to Italy, we have found the cheapest and the still high-quality hostels for you. So that while you are traveling you don’t need to worry about your accommodation! Here are 11 the best cheap hostels in Italy which you can stay during the whole country tour, from Venice to Milan and even La Spezia and Napoli! Finding a place to stay is always a big fuss. Especially if you are looking to stay on budget, it may require a long research process. You can give up until a certain point for the price but not everything, right? The key is finding the perfect balance between price and the service you will be receiving. So who can know the essence of this question? Old travelers, of course! These are one of the most popular, cheap and still quality hostels all over Italy – they are not regular or common hostels. Each has a unique way to reflect their own style and most of them are actually owns many rewards -including best location, the most popular and best-designed hostels of Europe. Are you getting excited to spend one the best budget friendly trip to Italy and still have the cheap accommodation there? Well, you came to the right place, keep reading! Yellow is a hostel that you are looking for in Rome. It literally has every little detail that you can’t even imagine – all suitable for your trip. First of all, it is very close to Termini train station. The complex also owns a laundry, gelateria and also a hairdresser in the street; so you can enjoy these services with a discount. Plus, they have a bar right across the hostel, so you can grab a drink after your check-in to meet other backpackers. Differently than other hostels, each bed has a locker here – which is pretty good especially if you’re a solo traveler and also they have free pasta for guests every day! Great ambiance, neat and decorated rooms with friendly staff. Price, location, staff and the cleanliness – those are the key factors why you should be staying in Ostello Bello. The hostel is in a very strategical position to the main attractions of the city. Milan is known to be one of the most expensive cities in Italy so for this price, it is hard to stay in such a central location. Also, we should add that the price includes breakfast and dinner as Ostello Bello is one of the rare all-inclusive hostels. Such a gem to find in Milan! The staff is also very friendly and make sure that you are spending a good time here. When you arrive they will greet you with a welcome drink as well – don’t miss it. Another great hostel in the art city of Florence is Archi Rossi. The hostel is situated right next to the central train station Santa Maria Novella. The price here includes a generous breakfast buffet, luggage storage, free WiFi and water from the dispenser. There is a big courtyard at the back of the hostel with a nice water fountain and some benches around. It’s a nice place to meet new people and also enjoy the cozy ambiance. The rooms are pretty spacious, unlike a regular hostel. In addition to the common dorm rooms, you can book small sized rooms as such as triple or double rooms with a private bathroom here. Hostel Pisa is located near the main transportation points. It is only 15 minutes walk to the Pisa airport and also 10 minutes walk to the main train station. So if you are looking for to spend your stay in the city of Leaning Tower, this place would be a most budget-friendly option for you. However, this does not necessarily mean that the quality is lower. On the contrary, Hotel Pisa is one of the most popular accommodations, especially for solo travelers. The hostel has a very lovely atmosphere with the vibrant decorations all over the building. There is a dining hall downstairs which you can enjoy all you can eat open buffet for 8€ – including your drink. Well, to be honest, Anda is more than a hostel. It is actually a complex – a rare thing in Venice. The interior and the architectural structure of the hostel is what make Anda different than others. The whole stay is carefully thought for the guests and that’s why it with all these details it is known as a design hostel. Anda is not on located on the main island but only one train stop away from there – which is Mestre, the town located on the mainland. However, staying on the mainland will save you tons of money. There are also local restaurants and grocery stores nearby – a thing hard to find in the islands next to your stay. You’ll thank us when you get there. Hostella is located right in the heart of Rome, only a few minutes away from the main train station Roma Termini. The hostel is on the first floor of a historical 19th-century building. There are only three rooms open for accommodation which means there is almost no crowd to disturb your stay. The name suggests a little bit as it is widely common all over Italy, Hostella is one of the women-only hostels. Especially if you are a solo woman traveling, you may want to take a look here to Hostella. The price of the room includes linens, internet and also a nice decent breakfast. Plus they have a terrace where you can relax under umbrellas and have a drink and chat with some friends during the summer. This place is known as the best hostel in all Italy and also the best 4th small hostel in the world! Truly, they have many reasons. Alone itself, the whole Cinque Terre area is a magical and heavenly place. However, due to the popularity and lack of space, the accommodation is rather expensive. The whole hostel rooms are actually scattered around the Cinque Terre area. So you can book a room from Riomaggiore, Manarola, Corniglia or Monterosso if you want. The price includes the luggage deposit, a nice breakfast, WiFi. The hostel is managed by a close friend group so you will feel a family vibe here. Here the hostel is right next to the forest area and nature is right at your feet. It is impossible not to spend a good time there with all these beautiful things and a stunning Cinque Terre view. Did you know that the first university in Italy is the University of Bologna? That’s why this city is full of the student even now and got many hostels to host students all over the world. Luckily, here is the best one in Bologna – found for you. The hostel is very close to the train station but it is located in a residential area so it might require +10 minutes to walk historical attractions. The rate of the room includes free breakfast, WiFi, luggage deposit and you will receive a free welcome drink when you complete your check-in! Also, you might consider renting a bike from the hostel with a discount as it would be very convenient to tour around Bologna by cycling. La Controra is a hostel situated only 15 minutes walk by the main train station in Certoso di San Martino. When you check-in, you will feel like you’re at home here. Even though it is not in the center, it is only two minutes away from the metro station. The staff is very sociable and very helpful at the same time. The breakfast is included in the room rate and much more delicious than a standard hostel one. They have a very relaxing garden at the back with the greenest grass and palm trees next to the outdoor seating area. Don’t forget to join their walking tours or floating tour of Napoli coast – all organized by the hostel. Enjoying Naples in the shade. If you are looking for a destination other than touristic and crowded cities, Lake Garda is the ultimate place to spend some days to relax. Fortunately, Meet Garda Lake is there to host you. The hostel became an iconic place along with the lake itself – it has turned into a hit among travelers. Lake Garda is a frequented spring and summer destination by both Italians and international traveler. As a result, the hostel keeps organizing events every day –when the season is opened in April. The rate includes the breakfast, linens, luggage deposit and also free shampoo and soap upon request. Happily, this is one of the pet-friendly hostels in Italy – they allow you to host your little friend in private rooms here! Generator could give you the utmost experience in Venice: It’s budget-friendly, experience and design-led, traveler-focused hostel. First of all, it is located in Giudecca, which is another small island right across the main island of Venice. 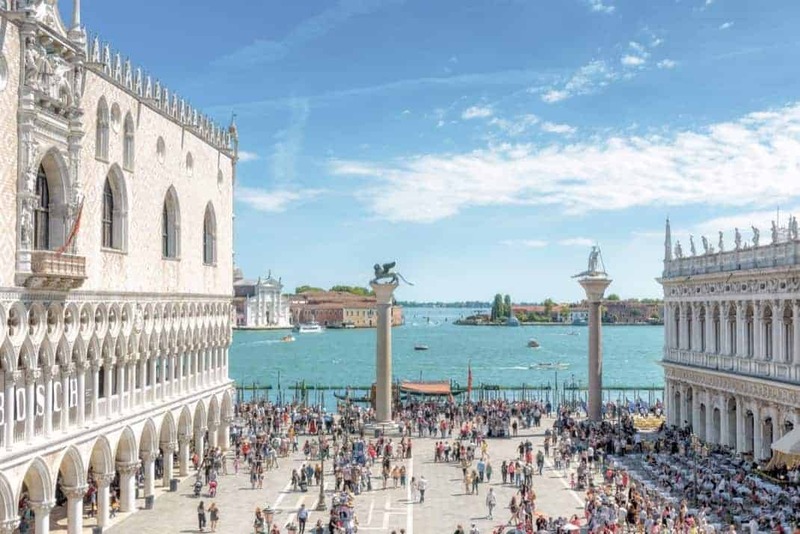 That means you will be still close to the main attraction yet far enough to avoid the noisy and busy streets of Venice. The common areas are designed in such a sophisticated way that you won’t believe that this place is a hostel when you first enter. The bar, the food, and the breakfast are also recommended by past travelers. The only thing is you have to buy a ferry pass for the length of your stay – as you’ll need a ferry ride to come and go back between the islands.